A raw milk food safety plan success story. Australia has the expertise to produce really great raw drinking milk and we have the international experience to prove it. Australian dairy scientist and microbiologist Dr. Ron Hull helped to developed the first food safety plan for Organic Pastures Dairy in 2007 while he was in California doing research. 2000. They now have a milking herd of 500 cows. The business supply over 600 stores, they are at 17 farmers markets and also have an online store. One of the owners Mark McAfee credits Dr. Ron for helping to shape the food safety plan that guided the family business towards success. The food safety plan is written in the 'food safety language' that Californian authorities can understand and appreciate. For more information on the history and the current OPD food safety plan, click here. 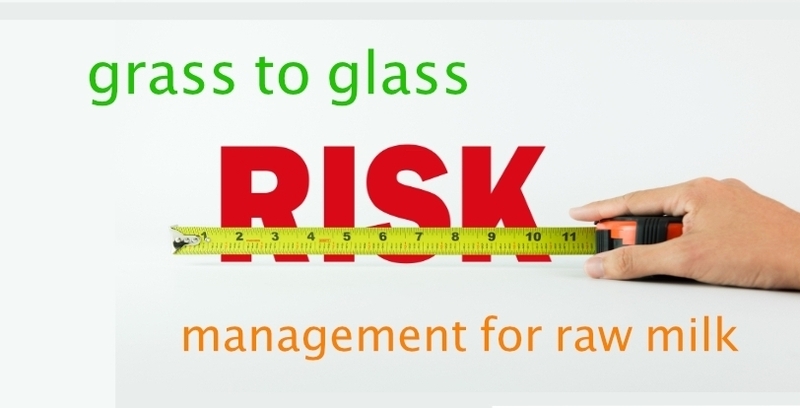 The Raw Milk Institute's Risk Assessment Management Plan is an on-farm food safety plan for raw milk producers to assess potential challenges on the farm and to manage the entire process "from grass to glass". It is specific and appropriate to farm size. Sometimes it is also referred to as Risk Analysis Management Plan. The RAMP assures that risks have been identified, explained, and are continually managed. Farmers can feel confident that they have the tools to produce a consistent low risk product and if something do go wrong, farmers have a toolkit and a map to instantly point them to potential problems. This detailed, pre-meditated plan is all about the unique setup on the individual farm. No RAMP plan will look the same. The dairy farmer is required to explain, in writing, the potential hazards on his/her own farm. and Australian food safety standards. It is a farm tool in the form of a standard template that helps farmers identify and manage risk on their farm, with their own unique circumstances. It is a management system of the entire food chain. When completed, a RAMP is a list of mitigating and reducing practises. It contains steps that teach how each factor plays a role on the farm. It’s a system of hurdles strategically placed between pathogens and the raw milk. It is also a standard that can be applied on any size dairy. The system is open, transparent, highly individualised and farmer-friendly. It eliminates some of the hidden obstacles sometimes seen in regulations that create frustration for farmers or set them up for failure in some unique way. The RAMP can be seen as an alternative risk management system that can be very useful in cases where governments are too lazy to set up a system that benefit both farmers and consumers. It is now used widely in America, Canada and even in European countries like Italy. Who is the Raw Milk Institute? The Raw Milk Institute or RAWMI was founded in California in 2010 in order to provide food safety standards, farmer education and farmer-to-farmer mentoring. They are pioneers in this field. The RAMP is at the heart of their mission. There are many farms in the U.S.A and abroad who have been utilising the plan up to 10 years. Many dairies around the world are not listed with RAWMI but use the RAMP anyway. To learn more about RAWMI as an organisation, see this article: The Raw Milk Institute. For information see RAWMI's Common Standards. It is a great way for the farmer to learn more about their own farm and identify risks that they may not have been aware of. Farmers also join an international community who understand food safety and reduction of risk with a long track record. The RAMP plan becomes something the farmer works on every day and results in a sharpened mindset with regard to food safety. The control and responsibility are in the hands of the producer. If something goes wrong in their business, they don't have to wait for someone else to tell them what is wrong. Their pre-meditated food safety plan is an effective and powerful troubleshooter. The objective is to create a longer shelf-life, great tasting and low risk milk profile for consumers to appreciate. Farmers can show their RAMP plan, along with test results to prove that they are taking great care to produce a high quality product. This helps the consumer make an informed choice about raw milk consumption. They can see evidence and grow confidence that the farmer is equipped with the appropriate resources. The RAMP is a tool to grow the trust that is so important in consumer-farmer connections. The RAMP outline helps new employees to quickly become acquainted with the farm during the training process. It can be a very valuable training and reference manual too. Food safety takes front seat during training. Having a RAWMI RAMP in place earns the respect of authorities because it speaks their food safety language, reduces the confusion and helps them come around to appreciating that farmers know what they are doing. In the U.S.A. some farmers have been able to get insurance or a reduction in insurance because they were using the RAWMI RAMP. See the free video presentation for more information. Image: a snapshot from the Write your own RAMP webinar showing the areas that should be included in every RAMP, click to enlarge image. The Raw Milk Institute produced a one hour long free video presentation available for anyone to view. The goal is to make RAMP writing simple and easy. It is presented by chairman of the board, Mark McAfee. Click here to view the webinar and enter your details. The listed farmers page on the RAWMI's website shows examples of other RAMP plans. This can be helpful for a deeper understanding. Click here to view the listed farmers and then click on the different farms to see their individual food safety plans. Remember: the RAMP is an ongoing process and it will be revised and amended as time goes on. Mark recommends saving documents in versions with dates on them. Image: this is a snapshot of the first page of Organic Pastures Dairy's RAMP plan, click on the image to enlarge or click here for more information and to see the entire document. are the general practises and the simple things that is done routinely to create the low-risk conditions. Most steps will fall into this category. is done because it requires extra steps. It is a written procedure that explains exactly the task of milking the animals from the time they enter the barn, until the milk is ready for the customer and all the equipment is cleaned and stored. The purpose it to provide enough detail so employees can perform the task correctly by reading the procedure without any additional instruction. The SSOP is expressed in great detail in a separate Word document and will accompany your RAMP spreadsheet. To learn more about SSOPs and how important they are from a business point of view, see the article Standard Operating Procedures for producing raw milk. is the very important measurable control point that must always be achieved. If CCP fails, production must stop until CCP has been investigated, the deviation or failure is determined and the CCP standards are remediated and achieved. There are generally only two things in this category; these are usually related to water or if an animal tests positive for TB. CCP points are usually the most important points where things can go wrong. Larger operations usually have monitoring systems for each CCP to detect problems asap. Microsoft Excel (a spreadsheet) and Microsoft Word (a word processing software) are required in order to open and write the RAMP template. Using the template, farmers will describe their overall system to ensure that raw milk is consistently produced and controlled according to quality and safety standards. They will express how risks are minimised at every step of the process, from the pasture to the final bottle. In addition, the application form to become a RAWMI listed member can also be downloaded and explored. The in-depth questions really show the kind of mental pushups that is important to cultivate a food safety mindset. The answers to these questions help RAWMI to identify more potential risks that they can discuss with the farmer. When farmers have completed the RAMP spreadsheet, the SSOP and CCP documents, the most challenging and important aspects of the listing process are done. These documents are then forwarded to the RAWMI board for review and they will then get back to the farmer with questions and suggestions (if any) for revision. Learn more about this panel of experts here. One of the greatest goals is to establish a track record of excellence showing that raw milk is a safe and low-risk product when done well. The Risk Assessment Management Plan helps to achieve that and satisfy the regulators with their often high demands. Every month RAWMI listed farmers submit their monthly “world class super low risk” bacteria counts which continue to build on previous years' data. This is the backbone of RAWMI. All of the listed farmers have taken this challenge personally, and their test data reflects this high standard. Each year the irrefutable data mounts and grows. Another organisation, the British Colombia Herdshare Association, is following in RAWMI's footsteps by creating a track record of excellence with their B.C. Fresh Milk Project and the Grass-to-Glass Raw Milk Training. "The Nobel Prize is not awarded to those that embrace the status quo. It is awarded to those that question the status quo and find a better way for humanity." For a more practical and easy to comprehend look at identifying and reducing risk see the webpage: Risk Identification and Risk Reduction Program.